With the dissolution of the monasteries by King Henry VIII, the Royal Charter of 1539 ensured revenues were granted to the bailiffs and commonality of Colchester on the condition that they founded a school; this was then enacted by the Charter of Queen Elizabeth in 1585, on condition that at least £13 6s 8d be set aside annually for the schoolmaster. Revenue from other property was also granted, but this was later challenged in court during the reign of King William III, and the arrangements were legally reconfirmed. By 1750, under the stewardship of Philip Morant, these revenues were worth £45 per annum, as well as providing scholarships for two boys to go up Cambridge University. The school was small and run mainly out of the headmaster's house for most of its early life, with only minor changes until 1852 when the "Big School" was built. At this time there was very little secondary education in this part of Essex, and difficulties were exacerbated through friction between the then headmaster of the school and the town's Corporation. Pupils numbers dropped although the school took in a few "parlour boarders" to prepare for Army or University entry. This changed with the appointment of Shaw Jeffrey to become headmaster in 1900. He took over a school with 29 boarders, and barely any staff. Shaw Jeffrey's reforms rapidly turned the school about; he introduced day boys and a prep school, a cadet corps, orchestra, bugle band, school entertainments and theatrical performances. He was a national pioneer of the teaching of modern European languages through phonetics, employed language teachers from Germany and France, and set up arrangements for foreign study during holidays. He also founded the Old Colcestrian Society to reconnect the school with its old boys, with Councillor William Gurney Benham chairing its inaugural meeting on 23 June 1901. The resulting academic success, scholarships and local goodwill that followed thus enabled Shaw Jeffrey to expand the school buildings, inspired by the designs of rival Ipswich and Earls Colne Grammar Schools. Firstly Mansfield House was bought in 1903 and renamed Gilberd House. In 1908 he convinced the Governors and local Education Board to expand the Big School and build a New School building for £4000 on land that was previously the kitchen gardens. This was designed by architects Newman, Jaques and Round, and was opened by Lord Rosebery with Colchester Corporation dignitaries in May 1910. 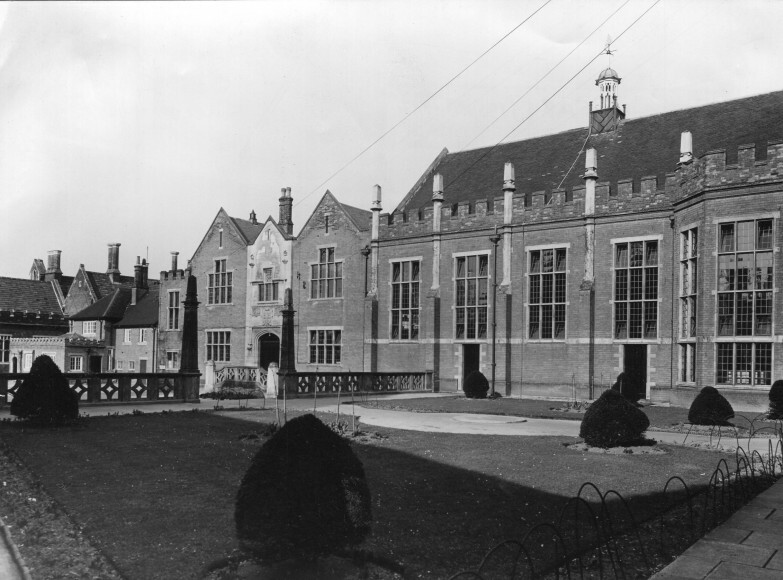 In 1911 the school was gifted 12 acres (49,000 m2) of playing field, and opened tennis courts and a small rifle range. By 1912 numbers had grown to 144 pupils in the main school, split into four houses (School House, Parr's House - formerly North Town - Harsnett's House - formerly South Town - and Dugard's House), and 169 younger boys in an attached preparatory school that the headmaster also started as a private venture. Pupils wore different coloured caps depending on their house, until Shaw Jeffrey noted that other local elementary schools were copying the colours. To confound this, he asked the local hatter "what was the most expensive colour and most hard to get", and hence chose purple and gold, which established the colour of the school uniform. This growth continued through the world wars until, in 1947, under headmaster J F Elam, there were 700 boys, and five scholarships for pupils to pursue university education. An outdoor swimming pool was constructed in the 1920s and remains in use. The educational expansion of the 1960s allowed the construction of new classrooms and gym; but the scholarships were no longer required with the introduction of free university education. The 1960s buildings have mainly been replaced; a new art building was opened in 2003 and the technology block was upgraded. In 2006 a new extension to the science building was completed and two new chemistry laboratories were opened. In the late 1970s, it was proposed to turn the school and the CCHS into a comprehensive by the early 1980s. Chelmsford's boys' grammar school would have gone independent. As it turned out, only the Gilberd School became a comprehensive. Essex County Council was not enthusiastic about the idea. It became a grant maintained school in the 1980s.